feels like a dual-sword wielder warrior 😛 Okay, I’m just kidding. 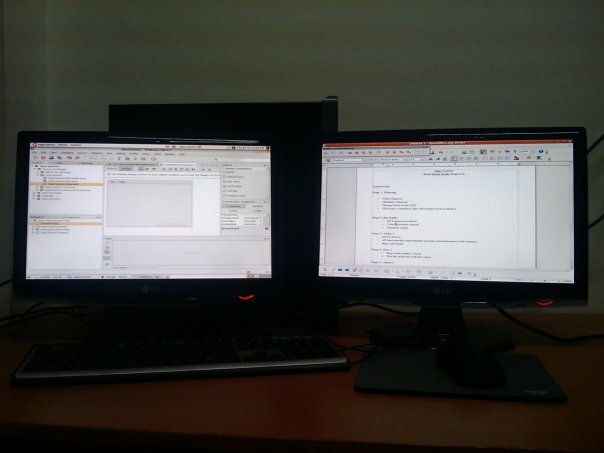 Many programmers recommended multiple monitors. Actually, I kinda like that too. Somewhat, I really want to use 4 monitors setting at my room in the future: left, center, right, upper. Left one for chatting/facebooking, middle for working, right for documenting, and the upper one for watching TV. Kinda cool, huh. emang nyusahin… apalagi kalo sambil chatting… lagi enak2 tiba2 ada window popup….